Pumpkins and squash are the perfect canvas for adding that extra spark of hair-raising décor to your door, porch or centerpiece this fall. They can be carved, cooked, painted or arranged into bone-chilling displays to add a little something extra to the essence of fall. Any type of pumpkin or squash can be carved, but your selection should be based upon what is easiest to handle. Healthy and blemish-free specimens are critical when selecting your fear-inspiring blank canvas. This will ensure your work of art doesn’t expire too quickly. A group of Tiger Pumpkins are piled up for sale. These are miniature pumpkins that measure 6 to 8 inches and are good for both eating and decoration. easy to cut and allow for ghostly light to shine through so your designs are illuminated. 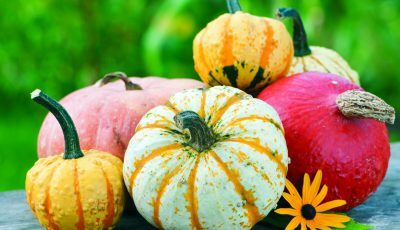 Sugar Pie or Trickster pumpkins are small, sweet and ideal for baking. Averaging five to six pounds, this pumpkin is easily manageable for kitchen concoctions. This allows for a smooth transformation from sweet buttery flesh into a delicious fall treat like pastries and soups. 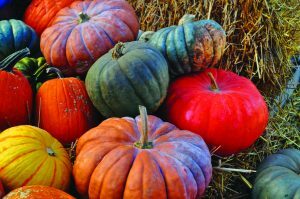 Cinderella pumpkins, also called Rouge vif d’Etampes, are a French variety. Inspired by the fairytale carriage, the Cinderella pumpkin will surely add a mystical element to your fall décor. Although this pumpkin has a tough outer rind, a minimal seed cavity allows more room for sweet flesh and makes it perfect for pies. Don’t be fooled by this pumpkin’s friendly varietal name. The Fairytale pumpkin will enchant any porch focal point with its pale peach, moonlit colored rind. These squatty pumpkins (one of my ultimate favorites) have a character-like aura in their own eerie way. Stacked or clustered, the Fairytale pumpkin is a must have for every porch this season. Other fabulous décor accents include the traditional mini and mini-tiger pumpkins. 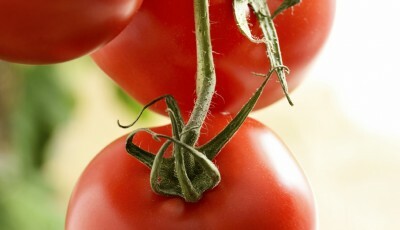 Mingle with any assortment of odd-shaped heirlooms for an aesthetically pleasing treat. Lunch lady gourds add the right touch of funkiness to a grouping of miscellaneous clusters. Bumpy, warty and unpredictable in shape and size, these additions scream Halloween and will make you tumble head over heel for fall. 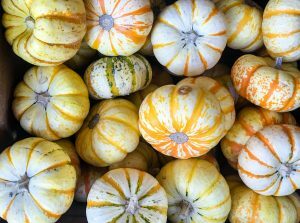 Don’t squash the idea of squash as a décor element either. Carnival squash add a splash of color to a table setting with alternating stripes of orange and cream. Mini squash such as the sweet dumpling are soft, fleshy and can be unveiled in a mix of green and orange striping against a white background. Best of all, these tasty dumplings can be cooked whole. Squash familiar to the culinary world include the hourglass-shaped butternut. Similar in appearance to the butternut but with matte skin are the shiny rind spaghetti squash and the famously nutty and rich acorn squash, which are not only delicious additions to a fall spread, but make fabulous décor items for a centerpiece or on a porch scattered throughout a pumpkin tumble. Succulents are another fun way to decorate your pumpkin. 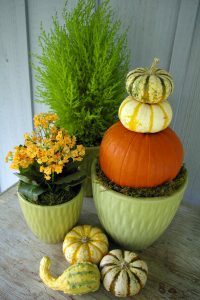 Plant them on the top of the pumpkin and make a fabulous fall centerpiece. 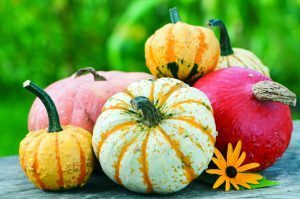 Whether you decide to carve, paint, cook or arrange your pumpkin, squash and gourd décor this fall, the trick to remember this year is to get creative. Branch out and experiment with varieties that you are unfamiliar with. Better yet, hunt for these favorites this fall. 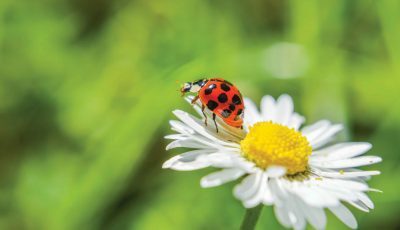 Your eye-popping décor will surely stand out this year. 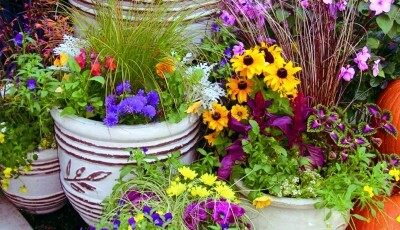 Kim Chapman is a sales associate and spokesperson for Armstrong Garden Centers.